Too often the compositions on Distraction are presented as basic, but a flurry of instrumentation makes this basic nature seem too easy instead of straightforward. 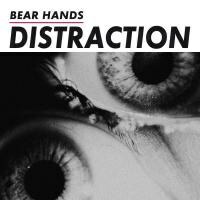 Bear Hands' new album, Distraction, is nothing if not aptly titled. These songs, industrial-sized, electronic-touched compositions built on a punk fury, are constantly shifting. They speed up, they slow down. They approximate the distracted mind well, especially on the frantic verses and wide-open choruses of "Giants", the stuttering pace of "Agora" or big troubling spaces of "Party Hats". These songs juxtapose elements, soft vocals with jagged guitars, say, to solid effect, creating maximalist pop tunes that both stick in your head and surround you with atmosphere. Outside of these highlights, though, too much of the album becomes buried under that atmosphere. It lays too thick on the slick propulsion of "Bone Digger". Layered distortion upsets the dream-like qualities of "Vile Iowa" without really changing them. "Though Wrong" skitters along, letting space render it small instead of stretching it out. In these moments, the compositions are presented as basic, but a flurry of instrumentation makes this basic nature seem too easy instead of straightforward. Distraction has its moments, but in the end the title isn't what this album overcomes, but rather what it surrenders to.